Netherlands is the home to many dikes. When most of your land is below sea level, you are always worried about flooding. So dikes and the Dutch are almost synonymous. Below is a short history of the dikes in and around Flevoland and North Holland. For the balance of the article the Dutch word DIJK (plural:Dijken) will be used in place of the English version when referring to proper nouns to help you recognize sites and places on maps. The first dijk was a small dijk connecting the top of North Holland to the island of Wieringen. On the map it is the small line to the left of the Afsluitdijk. The Amsteldiepdijk was the first attempt to keep the sea at bay. Today it is a tiny dijk, not very impressive compared to some of the huge dijken, but it was the grandfather of them all and an important first step. 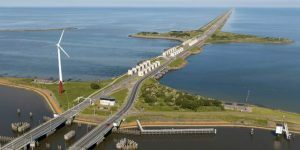 The Afsluitdijk is the most famous and majestic of the dike projects. This was the attempt to cut off the North sea and create a massive man made lake called the Ijsselmeer. It was a glorious success. Upon completing the afsluitdijk in 1932, the Dutch could began the plan for creating new land by pumping out the sea and recreating livable earth. Andijk was a tiny test polder, or land reclaimed from the sea, on the northern shore above Enkhuizen on the map. 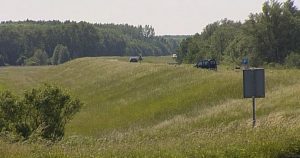 It is so small at less than 2km, that it isn’t even a dot on the map. But the town of Andijk is still there if you want to visit it. Wieringermeer was a large 18km polder founded on the eastern edge of North Holland close to the Amsteldiepdijk.This was the first successful attempt at reclaiming a significant amount of land from the sea. The late 1930’s saw the beginning of the Noordoostpolder. Although work on the dijk was interrupted by WWII it began a great place to hide Jewish refugees as the Germans wanted nothing to do with the swampy, half finished mess. At 55km, it was more than 3x the size of the Wieringermeer poulder with Emmeloord serving as its major town. The Knardijk is the dike the runs through the land about halfay between Almere & Lelystad. This is what separated the Eastern and south polder areas. While all the other dikes on this list are against the sea or man made lakes, the knardijk is primarily on land, although it does have a small sea facing section near Zeeworlde. The IJsselmeerdik forms the northern border of the easter polder. It starts just north of Lelystad and runs all the way up to the bridge over to Noordoostpolder. It ends just above the city of Lelystad. Just below the city of Lelystad, the Oostvaarderdijk begins and runs all the way down to Almere Poort. The beautiful nature reserve is on one side, complete with wild horses, while the IJsselmeer is on the other side. This is one of the best site seeing tours whether by bike or car. The Gooimeerdijk runs along the southern coast of the southern polder, just below the city of Almere. Almere Haven is the small town that has a beautiful harbor at the beginning of the Gooimeerdijk. It ends where the A27 crosses and separates the Gooimeer from the Eeermeer. On the SE corner of Flevoland, east of Almere is the Eemmeerdijk. Starting at the A27 bridge it wraps around the southern coast of Flevoland until it connects with the small part of the Knardijk that is on the water. This route takes you to Zeewolde and Harderhaven of the eastern edge of Flevoland. After going through Zeewolde heading north, you will run into the tiny bit of the Knardijk than is on the water. Then through the town of Harderhaven, and after that the next dike is Bremersbergdijk. This dijk continues up the eastern edge of Flevoland past Walibi World, the amusement park, until you hit the N309 bridge to Kruismaten. North of the bridge to Kruismaten begins the Drontenmeerdijk. 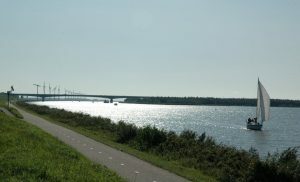 The dijk continues north until the N307 bridge that connects Dronten and Kampen. Just north of this bridge is Roggebotsluis, the original canal lock that connected Dronten and Kampen on the Vossemeer. North of the N307 is the Vossemeerdijk. The Vossemeerdijk is a very scenic ride along the NE corner of southern Flevoland. There is very little up in that area save a bike path, a road, and some beautiful views. This is very much off the beaten path, but well worth the effort for those who undertake it. The last dijk around the southern polder is the Ketelmeerdijk. The Ketelmeer is the huge lake that separates the northeast polder and east Flevoland. Going north on the A6 will take you to Emmeloord and Urk on the northern polder, and after than into Friesland. Heading south will take you back to Lelystad, and Almere another 25km south of Lelystad.